Derrick Rose recently threw a costume party for his son PJ's birthday, and it looks like everyone was really into the theme. 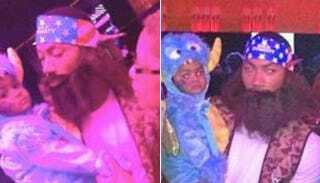 PJ appears to be in a much better mood than the last time we saw him around these parts, and Rose is rocking a pretty great Willie Robertson costume. I would not have guessed that Derrick Rose watches Duck Dynasty. Beyond the Buzzer has some more pictures from the party, if you want to check them out.